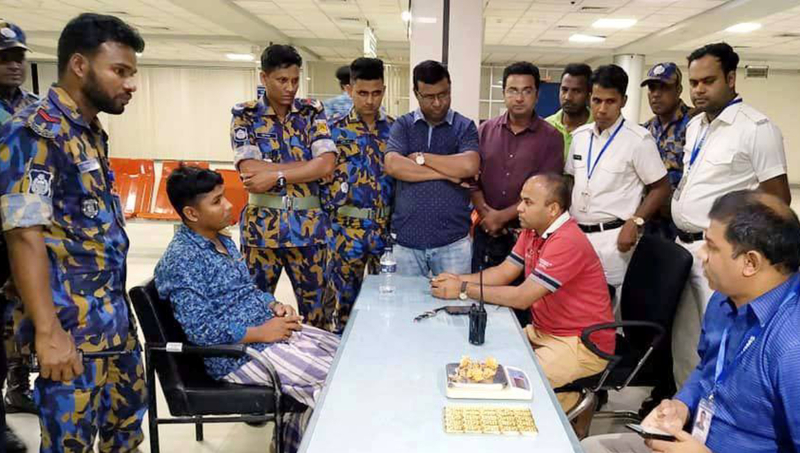 Sylhet Office : Customs officials detained a young man along around 3 kg gold at Sylhet Osmani International Airport on Friday afternoon. The detainee is Abir Hossain, 31, son of Abdul Aziz hailing from Hatia upazila of Noakhali. Nurul Amin, customs officer at the airport, said a Dhaka-bound flight from Mascot via Sylhet landed at the airport in the afternoon. On information, a team of customs officials challenged Abir, who was scheduled to disembark at Hazrat Shahjalal International Airport in Dhaka, and recovered 25 gold bars and 100 grams ornament searching his handbag. Later, he was handed over to police, Nurul said.